Aurora Audio GTQC Preamp Compressor Channel Strip Grandmaster Recorders #28712. Techno Empire is honored to present for sale this piece of recording equipment from legendary music studio, Grandmaster Recorders. Originating in the 1970s as Hollywood Bijou Studio, where Stevie Wonder wrote and rehearsed his classic album Songs in the Key of Life, it later changed its name to Grandmaster Recorders where it produced dozens of acclaimed albums such as Red Hot Chili Peppers One Hot Minute, Becks Midnight Vultures. Tools 10,000 Days, No Doubts Tragic Kingdom & Queens of the Stone Age Songs for the Deaf to name a few. 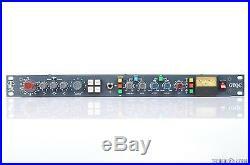 DESCRIPTION : This listing is for an Aurora Audio GTQC Preamp/Compressor Channel Strip. This unit is a very personal item to Grandmaster Recorders as Aurora Audio was more or less born there as a partnership between early Neve designer/engineers Geoff Tanner and David Langford and Grandmaster studio owner Alan Dickson. This particular item is one of the earlier versions of this model if not the first personally built by Geoff Tanner. ACCESSORIES : Bundled with an IEC cable, this item comes only as seen in photos, and does not include any other accessories. This one looks like it was installed in a rack a few years back, then left there to look pretty ever since. Aside from a few light rack scratches on the top and bottom, this unit is flawless, and the front specifically looks out-of-the-box new. Both sides of this channel strip are effective and have loads of punch to them. The EQ is smooth and quiet, while still being perfectly capable of blasting when needed, while the compressor's myriad settings are all perfectly operational. Killer combo in exquisite condition! ACTUAL WEIGHT : 12.70 lbs. ACTUAL DIMS : 19" x 1.625" x 12.75. We strongly suggest that you check your order after receiving it to be sure that it is in proper working order. NOT WORKING - FOR PARTS - AS-IS. We do our best to fairly evaluate the condition of a non-working item and give an honest description of any symptoms. If there are any further conditions, missing parts, or dead-issues with the item that are unknown in this type of listing, we will not be held liable for it. It does not cover such things as normal wear and tear. Incorrect voltage, un-authorized or self-repair, moisture damage, failure to follow manufacturers instructions or incorrect application etc. Acts of god, the old gods and the new gods, forces of nature, items with removed serial numbers, microphone ribbons, speaker drivers, capsules, batteries, tubes, bulbs, damage resulting from the use or misuse of voltage regulators, losses incurred from loss of business, clients, down-time, profits or for personal inconveniences or expenses in travel, gas etc. We also accept all major credit cards. Please inquire for a special quote. Direct signature on packages is an option. Packages lost due to theft are not the responsibility of Techno Empire Inc. Examine all boxes upon receipt by the carrier before acceptance. Carrier must note any damage to the box on a release form or you can refuse acceptance. Any items that you receive that have exterior damage to the box or damage to the item, or missing parts or accessories, please report this immediately to customer service at Techno Empire. Please keep all packing materials, accessories and merchandise tags for any item you want to report a claim. Please inquire for rates if you do not get a rate from the calculator. Techno Empire will not be responsible for any packages that are lost, stolen, or damaged in International transit. This includes all packing materials, accessories, manuals and related documentation. Return items must be repackaged for safe return with the same care in which you received it. Return items must be insured for at least the full value of the item. When you receive an item, open the package using a box cutter and be mindful not to tear up or throw away the box or any internal packaging. Without having to curb your enthusiasm of basking in the glow of your new piece of gear, think in terms of preserving it in its mint condition until certain you are keeping it. For instance, if it were rack gear, we would recommend avoiding racking it until you were certain it was a "keeper". Thus preventing any possible "rack rash" or scratches. If it were a guitar pedal, avoid sticking Velcro on it and mounting to your pedal board until it passed your test to be knighted and sit at your round table of pedals. Although tempting to have both of your favorite things together, put down the chicken wings slathered in barbecue sauce that is dripping all over your leather vest and beard and be sure your hands are clean and dry before trying out your awesome new gear. Pet odors, cigarette and other smoke items can also affect the "newness" of your gear. Also, keep the gear away from your friend with the Billy Ray Cyrus mullet driving the Camaro. He's a good guy and he means well, but years of smoke tar and beer bongs have dulled his perceptions. Incorrect voltage, self-repair, exposure to extreme temperatures, moisture damage, or incorrect application, etc. Earphones, microphones or other items that have intimate mouth, face or body contact. Software, computer hardware, computer drives and other digital or media tape. Items that are special orders, discontinued, or closeouts, are all non-returnable. HOW TO RETURN YOUR ITEM. The item "Aurora Audio GTQC Preamp Compressor Channel Strip Grandmaster Recorders #28712" is in sale since Sunday, July 09, 2017. This item is in the category "Musical Instruments & Gear\Pro Audio Equipment\Preamps & Channel Strips".